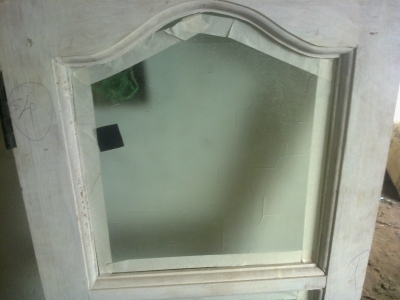 Carpenters will perform sanding process to remove ups and downs in windows. After this Wood primer will be applied. Metal paste will be applied to all the windows . metal paste will fill the gaps in windows. Once metal paste is applied, painters will apply steel putty for the windows. Steel putty will be applied two times. Steel putty or KPF putty is used to fill the dents or uneven surfaces in wood. With this wood surface will become smooth. This putty will be available in ready to use steel cans. Before applying the steel putty, painters apply a tape through the corners of glass. you will get this tape in paint shops. This is to protect glass from paint. 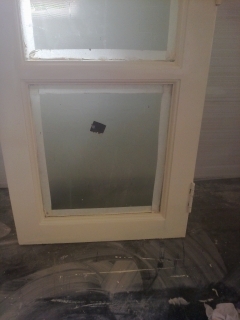 Glass will have rough surface because of glass design. Once oil paint applied to glass then it is difficult to remove it. So in the corners this tape will be applied. After steel putty is applied painters will perform sanding process to get more smoothness to windows and doors. 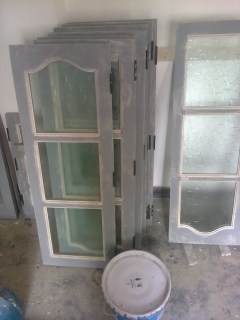 For the below windows steel putty is applied and sanding process is completed.